When we left off at Bollyviewer's site (this post won't make sense unless you read hers first): the SMILE coalition was all but forced out of CHARM by the Vinod-led SMOULDER faction. SMOULDER wanted the men of India to simply scowl, storm around, and spit at their lady loves. 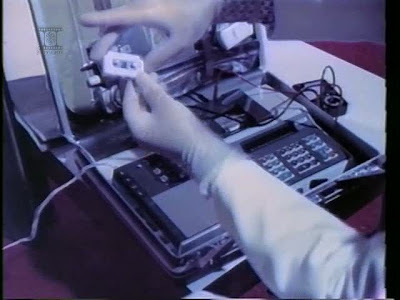 Some of the leading heroes and all of the villains were following Viond's lead, relieved to finally find a romance technique that would work for them since they were unable to master the subtle, gentle, thoughtful style of the SMILE coalition, led by Shashi Kapoor and practiced to great effect by his newphew Rishi, Jeetendra, and Rajesh Khanna. Even leading middle-ground proponents like Dharmendra and Amitabh Bachchan were finding it hard to resist Vinod's arguments...well, his angry mutterings more than proper logic-based statements, but when he rode up carrying rifles, it was hard to stand up to him. his dangerous hotness cannot be contained. I know him well enough - and have seen the effects he has on our heroines! - to know what a threat he poses." Distressed, Shashi headed back to Bombay. The PM was determined to find a way to halt the influence of SMOULDER. The economic damage has been bad enough, but the thought of them trying to manage relationships between the women and men of Hindustan makes her weep for the future! If in fact there can even be a future, since the women are running away and hiding from all this poser-dacoit nonsense! "India as we know it cannot continue to function this way!" she exclaimed. "What would India be without ishq, pyaar, and mohabbat!" The PM called a meeting with all her top advisers. Chaos reigned as each person shouted out their ideas of how to address the crisis in the nation. The Minister of Health and Family Welfare exclaimed "Let's call on Shashitabh, the power jodi of the decade! Surely no one can resist their pleas!" Ms. Gandhi replied, "No, not this time. Shashi is already under enough stress, and poor Amit has been rendered useless by grief, pouting and sulking and writing awful poetry." "Dharmendra and Hema, then?" wondered the Minister of Home Affairs. "Even if they could pull their attentions away from each other, it's a job far bigger than even their capabilities can handle." "Then what can we do?" cried the Minister of Women and Child Development. "Even lakhs of young women praying at temples has not been able to ease this national fever!" "The gods themselves are powerless, I'm afraid. Prayers are no match for the misguided deeds of half the nation! 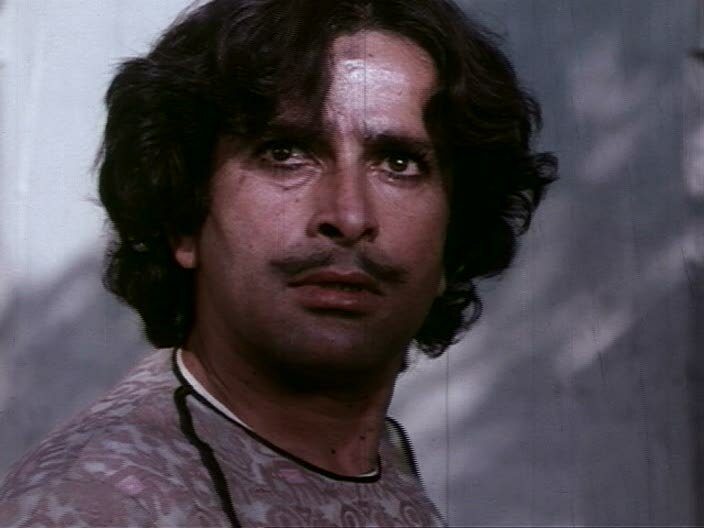 The economy is crumbling, people are starving, and all the women are lonely and desperate without the likes of Shashi Kapoor to beguile them. I have no other choice: I am suspending the constitution and declaring Emergency." Government policies were swift and severe. With the army and police given free reign over the streets, SMOULDER was driven underground, where it continued to attract the allegiance of India's males. Countless law enforcement officials succumbed, desperate to shed their boring khaki uniforms and become as handsome and attractive as Vinod. Women continue to back SMILE, but with so few adherents, there simply weren't enough men to go around. Neetu Singh and Shabana Azmi made heartfelt speeches to the sisterhood about the importance of maintaining their values and not succumbing to the glowering, swarthy appeals of SMOULDER. The tensions even began to take its toll on bouncy, sunny SMILE leader Shashi Kapoor, who was so distressed at the situation that he had very little energy to bring forth his smile and other charms, thus inadvertently depriving the female population of what little romance they had left. Amazingly, the notes break off for months and months, skipping over the trials and tribulations of Emergency. They pick up again in 1977 to reveal what the PM did to solve this horrible situation. Two years have passed, and Ms. Gandhi is no closer to solving the disaster created by SMOULDER. One of her old friends and trusted advisers, Anthony Khan, recommends she take a little break with a new film, Dharam Veer, and sends her an advance copy for a private screening. After all, a good masala flick will at least help her better to understand the pulse of the nation, the dreams of the people, as depicted by one of India's greatest filmmakers. And it is during this film that Indira Gandhi had the best idea of her career. She may have started the film hoping just to relax for a few hours and enjoy Jeetendra's cavalcade of frilly shirts and Dharmendra's saucy dialogue delivery, but, miracle of miracles, she left with a sure-fire plan to save the country! She rushed to her office after the screening and called her cabinet together. As they all filed in, rubbing their sleepy eyes, they wondered what on earth she needed to talk to them about in the middle of the night. Once they were settled in, she announced triumphantly "I've just figured out how to bring our nation back together!" With all the cabinet ministers looking on in awe, she pushed a secret button under her desk, and as two panels slid open on her credenza, a glitter-encrusted phone appeared. She picked up the receiver and said "Yahooooooo!" The assembled ministers blinked in disbelief. What could she be saying? She continued with her mysterious conversation, using a name they had all heard but to which they had never seen a face attached. "Khan, is that you?.... Yes, I know it's late. But Anthony, India needs you, now more than ever.... It's come to this. You must bring me the only two people in all of India who can solve this problem.... Theek hai. We'll wait." A few tense hours later, the entire cabinet was stunned as Shammi Kapoor, a.k.a. Anthony Khann, Chief of Staff for the National Integration Committee, marched into the office with each hand on the arm of a confused, bespectacled man. Khan/Kapoor spoke: "Madame. I present you your willing servants and unparalleled lovers of Hindustan, the Masala Masters themselves: Manmohan Desai and Prayag Raj." At this point, the government transcription office must have gone crazy as the cabinet broke out into murmurs in all official languages, expressing shock, surprise, appreciation for this wisdom, and, it must be said, glimmers of hope. The notes indicate that the PM was only able to restore order by whipping off a chappal and threatening the politicians with it, muttering something about khoon under her breath. The Minister of Defense shouted "Madame, do you realize what a huge undertaking this will be? We cannot just unleash the mighty forces of Masala without careful consideration. To employ them on a domestic mission is to leave us vulnerable to attack from neighboring countries!" "That is true," she replied wearily. "But who else could possibly devise a way to get at the heart of a national crisis of this magnitude? Who else can heal an Indian divide so effectively? Who else can show the right way to be an Indian hero?" The ministers are all on record as agreeing to the plan. Believe it or not, the next document in this file Bollyviewer and I were given is a summary of what sounds very much like a film - except it isn't a film, it's real life! Indira Gandhi's brilliant idea was to ask Desai and Raj to write a script that would trick all of the members of CHARM into an emotional and heartfelt collaboration, proving to them that they were better off working together than separated into factions that cause the nation such grief and chaos. 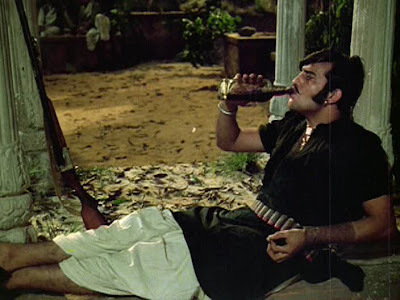 For once, all the actors of India worked together on an elaborately plotted script that bore directly on reality and had huge consequences (and no time for tea breaks)! Even more amazingly, the script had the desired effect, as everything went according to the plan of Gandhi, Kapoor/Khan, Desai, and Raj. The actors - both those who were in on the plan and those who were merely responding to the scene set before them - fell into their roles brilliantly, many of them without even realizing how important their work really was. The action was kicked off by Nirupa Roy, who called Vinod and SMOULDER with the horrible news that Pran has kidnapped the entire female population of India! 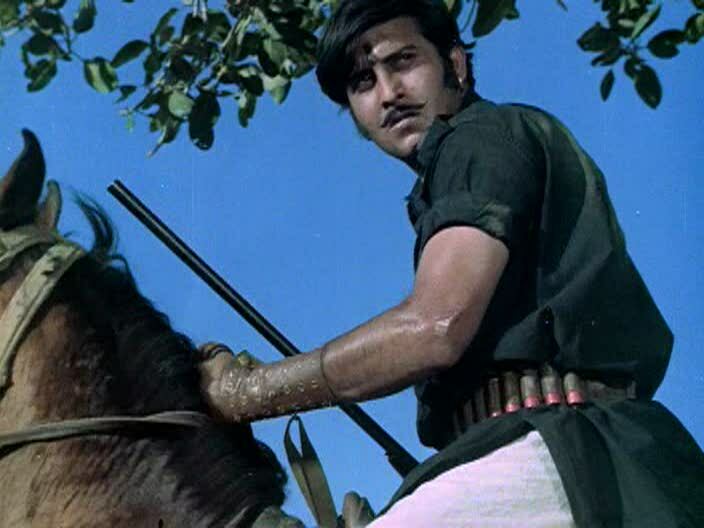 Unable to resist a call for help from such a source, Vinod and his fellow smoulderers gathered up all their guns and horses and raced to Pran's HQ to dishoom him. With Pran out of the way, they assumed they'd rescue the women and be off! But nothing is ever so simple in a Desai film! In this case, Pran was merely a puppet of the real villain: Bindu! She strode out from her secret lair, flanked by Helen and Laxmi Chhaya, returning SMOULDER's stares with ease. SMOULDER was dumbfounded: were they even allowed to fight with women? Disputes among the ranks broke out, and Vinod finally called them to order with an occular plan of attack. They tried their best to glare at them to make these women weak in the knees and give in, but they were tougher than the men - even tougher than Vinod, Ranjeet, and Shatrughan put together! Distressed and dejected, the machos returned home to Nirupa to admit their failure. They stewed and brooded all the way home, singing a depressing song about how they cannot believe their formidable powers did not work. Nirupa, who of course was in on Desai's plan all along, knew they would fail and was ready with further advice on how to win over Bindu and her crew. SMOULDER would keep meeting defeat until they incorporated some SMILE. This particular devi cannot be impressed solely with smouldering - she requires some finesse as well. Nirupa called Shashi and SMILE for help. She knew her appeal to their confidence in their romantic ways would easily bring them into the plot, especially if she acted as distraught as possible. She flattered Shashi with sweet words: "I've known you since Dharmputra! I may have chosen Amit over you in Deewaar, but that was just a film! You are really my favorite. Help us, please! Only you can save the women of India from this horrible fate! I beg of you, help us!" He replied, "Of course, Maa! As long as you don't expect me to smoulder, I'll do anything for you!" and fell at her feat, sobbing. She took him to the temple, saying "Beta, place your hand on the statue and promise me that you will do whatever I ask," and he did so, wiping away a tear and secretly wishing there was a camera around to capture a scene to prove Nirupa loves him more than Amitabh. 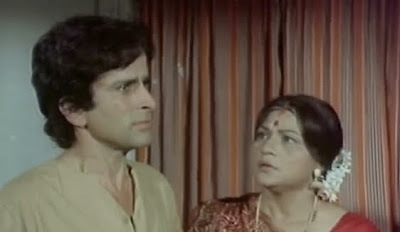 Nirupa then revealed the plot: Shashi and SMILE must join forces with Vinod and SMOULDER to get the job done and restore the nation to order and unity. Shashi grudgingly admitted that he has to do what he has promised, so Nirupa arranged a meeting between the two factions. The next day, Vinod and Shashi met, alone, on a desolate hilltop, one in his dacoit ensemble, the other in his trademark white suit. 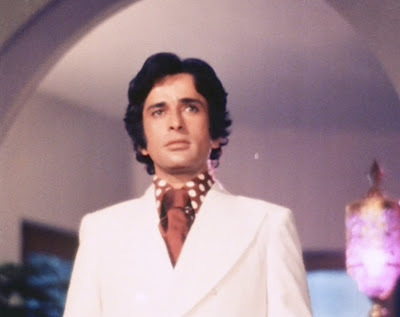 At first, things were very tense as Vinod circled Shashi and growled, but Shashi eventually broke through all the tension with just one word uttered in The Voice: "Bhaaaaaaaaaai!" The two clasped hands, embraced, and set out to save the women. 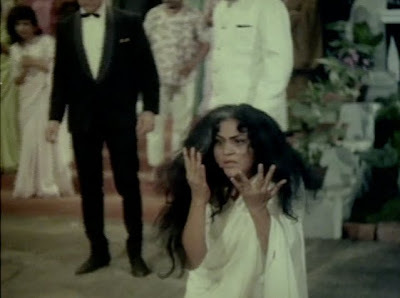 Once they reached the evil HQ, they did an elaborately choreographed dance - how they knew the steps remains a mystery, since no choreographers were involved with the project, even in secret - in front of Bindu, Helen, and Laxmi, who shared a wink among themselves and pretended to melt hopelessly into puddles of pyaaaaaaaar as the supporting cast of men join in. Really, who could resist Shashi, Vinod, Rishi, Jeetendra, Feroz, and Dharmendra all together? While the top women were distracted, the "kidnapping victims" were rescued by Ranjeet, Dev Anand, Shotgun, and Rajesh Khanna. The women, who are also in on the plot, emerged when they saw that both SMOULDER and SMILE had joined forces to restore romance to the nation. Out of nowhere, sweeping violins crescendoed as the entire cast - even Pran, who made a miraculous recovery from Vinod's earnest dishooming- joined hands and walked into the sunset! BLOOMS OF ROMANCE FRAGRANT ONCE MORE! Though the Emergency was over, Prime Minister Gandhi, along with the reunited CHARM, wanted to make sure this disaster never happened again. The entire film fraternity got together to make sure every actor could master both styles. Even Shashi learned to smoulder; Even Vinod learned to smile. This strategy has been so successful that it has continued down through the decades to today, with current heroes like Abhay Deol and Shahrukh Khan being fluent in many kinds of romance. Readers, what do you say? Which of today's heroes has most successfully mastered SMILE and SMOULDER? There is a poll on this blog and Bollyviewer's for you to vote in. If your top contenders aren't listed, write them in in the comments. Update to post (July 6, 2010): here are the results of the poll. The top three you all chose are exactly what I would have done if just choosing on my own. Oh joyous SQUEEEEE for the linking of SRK and Shashi! OHHH MYYY GAAWWWDDD! That was the most hilarious thing I've ever read! I'm glad Vinod and the SMOULDER gang teamed up with Shashi and the SMILE crew, truly a meeting of the two great minds and looks to save India! Beth you need to rewrite this into a Masala Pradesh movie that I need to produce! OMG how do you guys do this?!?! SO BRILLIANT!! While reading this I've been laughing so much my brother thinks I've gone mad! This is true masala, worthy of Desai-sahib at his best! :-D You two are hilarious. This was absolutely brilliant Beth. Now I have to think of the likely heir-apparents to SMILE and SMOULDER. Absolutely amusing, as usual. Now wil you pleeeaaassee watch Kites and review it already?